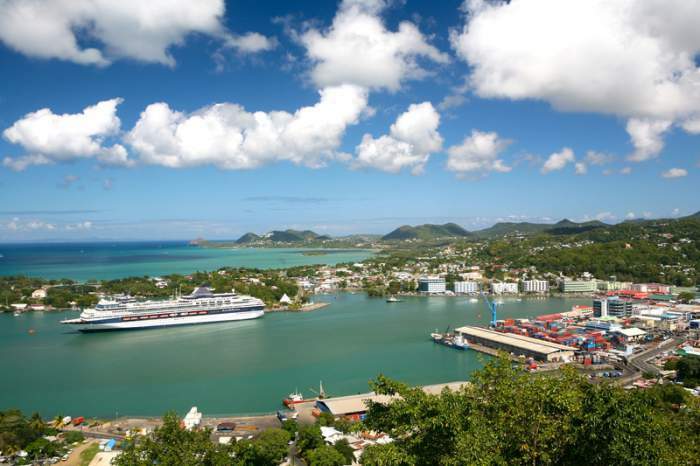 St. Lucia vacation is growing in popularity among beach lovers, as well as cruise ship passengers. St. Lucia, your next perfect Eastern Caribbean destination, is waiting to be fully explored and enjoyed. Although, tourism is still growing and the island is still at its' expanding stages, tourists feel welcome, pampered and entertained while vacationing here. Excellent resorts, top-notch service, fun and exciting activities for the whole family, volcanic beaches and bubbling springs, amazing reef-diving sites, pristine, azure-water snorkeling spots and fishing villages, mysterious waterfalls and the highest Piton mountains are just some of the treasures of this glorious island that are waiting for the visitors. St. Lucia beaches are of volcanic nature and range in color from white, yellow, golden to black. 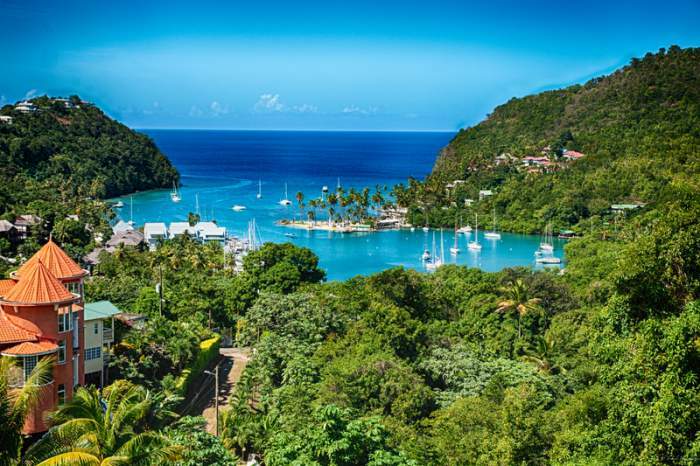 Don't think twice, make St. Lucia top your list of the best visited Caribbean destinations! Why go on St. Lucia vacation? St. Lucia is a more secluded yet quite adventurous island that many travellers dream about. It is considered to be a Caribbean jewel with its continuous rich rainforests, extraordinary marine life, colourful ecosystem, about 500 gorgeous parrots flying in the wild, and countless possibilities to explore the island, its rich culture and history. Attractions and activities are in abundance in St. Lucia, you just choose one or all of them to have the best experience during your St. Lucia vacation. Cruises and sailing, dolphin watching and horse-back riding, cultural and sightseeing tours are just a few options for those discovering St. Lucia. 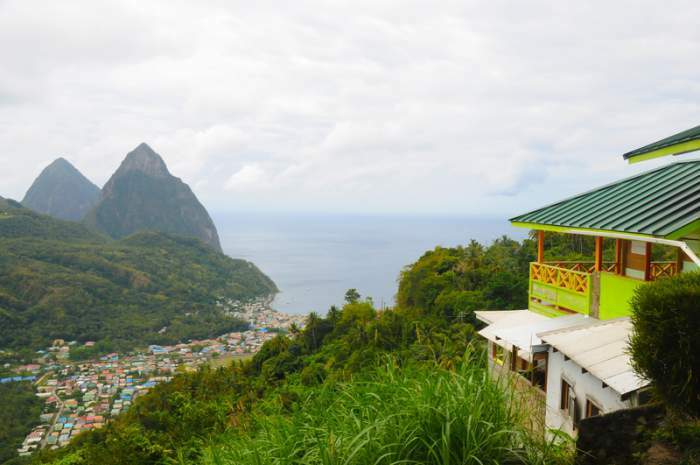 Find out what St. Lucia is famous for by visiting the Pitons - twin mountainous volcanic plugs, that have the second highest point on the island at 771 meters (2,530 feet) high, or La Soufriere Volcano, the inactive "drive-in" volcano allowing visitors to walk along its crater and admire a stunning view of the surroundings. Sulphur Springs will leave you speechless with the hot bubbling springs along with the volcano heat that will sure recharge your senses once you dive in. On your St. Lucia vacation, visit the Marigot Bay, a fantastic attraction for snorkeling, swimming, or even taking a photography lesson. Dr. Doolittle movie was filmed right at this majestic place, so you will see what it feels like to be a star once you arrive here. To come closer to the history of this marvellous place, definitely pay a visit to the Morne Coubaril. It will introduce you to the historical site of houses of the plantation workers built years ago and will treat you to some locally grown produce. Although St. Lucia welcomes its visitors all year around, there are ideal times of the year, when your St. Lucia vacation can be perfectly budgeted and fully enjoyed. The busiest and the most expensive time to vacation on this picturesque island would be from December to April. This is the time for school breaks and Christmas and New Years holidays, so expect excessive crowds during this time. Hotel rates are sky-rocketed and must be booked months in advance. Since this time of the year is considered a high-season, it is impossible to get anything reasonably priced. The best time to visit St. Lucia is between the months of May and June during the island's off-season. The lodging significantly drops down in price, offering good and very affordable discounted rates and the temperatures stay between 25-31 degrees Celsius (77-87 degrees Fahrenheit) without the humidity and with pleasant tropical breezes. For music lovers, St. Lucia hosts a Jazz & Arts Festival in early May, definitely a reason to combine your St. Lucia vacation with some music fun at this time. If you are looking into saving even more and are not afraid of the Atlantic hurricane season that lasts through summer and fall months, then book your St. Lucia getaway anytime from July to November. Hotel rates are significantly lower, the temperatures stay in the high 20s-low 30s degrees Celsius (77-87 degrees Fahrenheit), there are no long wait times for booking tours, activities and restaurants, but the downfall is that there are high chances of showers in this off-season period. Some of the key events in the off-season include the Carnival in June/July, the Billfish Tournament that takes place in September and the Chocolate Heritage Month in August just to name a few. Although the summer months are generally more quiet, there is still plenty to do and to see to get the best out of your St. Lucia vacation. Where is St. Lucia on the map? The beautiful island of St. Lucia, sheltering the magnificent rainforests, lush tropical vegetation, the great Piton Twin mountains and exciting and exotic activities is located 173 km (107 miles) southeast of Dominica and 174 km (108 miles) northwest of Barbados. Although St. Lucia is relatively small being only 44 km (27 miles) long and 23 km (14 miles) wide, it still provides boundless hiking and bird watching trails. St. Lucia is also located 81 km (50 miles) south of Martinique and is easily accessible by way of a ferry from either one of these islands. Castries, the capital city of St. Lucia is located in the heart of this mountainous, volcanic Caribbean island, at a natural harbour of St. Lucia's northwestern coast. Castries has approximately 80,000 residents as of 2016, and plays a major role in being the main cruise ship port of the island. While Castries does not hold a lot of popular tourist attractions, it makes up for the lack with its' big personality, freshly cooked authentic cuisine, busy streets and a charming population, and did we mention the duty free shopping too? While you are in the capital on your St. Lucia vacation, take your time to explore some of the historical sites of this magnificent city. All government buildings are situated in the downtown core of Castries, as well as local and even international businesses hold their offices here. 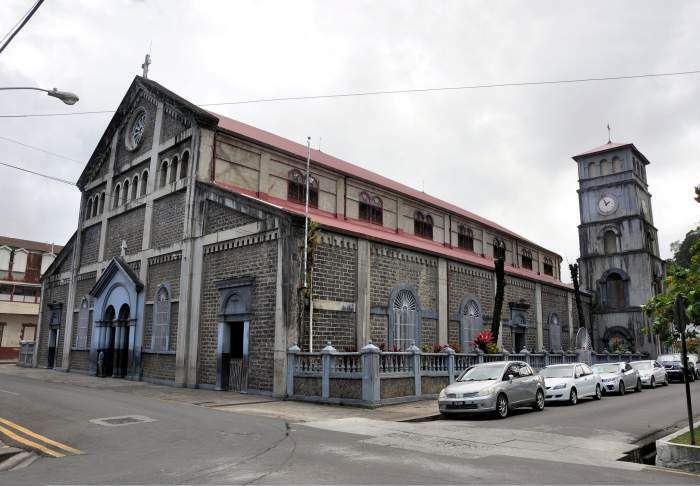 When exploring the Old Town in Castries, an enchanting neighbourhood with older buildings with hanging balconies and impressive views, and a touch of French and British influence, check out The Cathedral of the Immaculate Conception, the largest church in the entire Caribbean, with beautiful murals and an Italian clock-tower. Derek Walcott Square, where the cathedral is located, that is surrounded by colourful buildings, a public library and well-preserved colonial buildings is a must-see attraction as well, do not miss it. Buses and taxis run on a schedule in Castries, making their stops at all possible island destinations, hop along and discover the true colours of this unique island. As of 2016, population in St. Lucia is estimated to be 186,933, and the median age on the island is 31.6 years. Most of St. Lucian population is of African descent, many of whose ancestors were brought over to the island as slaves. Some American Indians and a few other ethnicities also inhabit the island, but the number of residents of African descent outreaches all other ethnic groups. Roman Catholicism is the predominant religion in St. Lucia, and although it makes up about two thirds of the entire local population, other religious denominations such as Anglicans, Methodists, Baptists and others are also practiced here. St. Lucians are extremely friendly and welcoming people, and once you land on the island, you will be greeted with hospitality and respect. Most of St. Lucia's economy is based on tourism, just like in many other Caribbean destinations, so they understand the value each foreign guest holds and go out of their way to provide the best service possible for their St. Lucia vacation. Experience a remarkable culture of the island, while still feeling right at home during your St. Lucia vacation. English, the official language of St. Lucia is also the language of instruction and is used in schools, government operations and media. Although English is the primary language of communication on the island, many residents here speak creole as well. It is a unique dialect based on French with the influence of west African languages. Even though creole, also known as French patios, is widely used by most population of St. Lucia, 20% of residents are not bilingual. This percentage of locals do not speak English, and, therefore, government has made several attempts to target these groups of people to enrol them in language programs, so they integrate well with the rest of the local society. Several international airlines offer non-stop flights to St. Lucia from some of the world's major cities. Direct flights from the United States and Canada are available from Miami, Charlotte, Philadelphia, New York, Boston, Atlanta, New Jersey and Toronto. United Kingdom provides direct flights several times per week as well, while Montreal (Canada) and Germany offer non-stop flights for St. Lucia vacation only at peak times of the year. All international aircrafts land at Hewanorra International Airport that is located in Vieux Fort, about 64 km (40 miles) south of Castries, the capital city of this stunning paradise. George F.L. Charles Airport, a small scale facility, located 2 km (1.25 miles) north of Castries, offers inter-island flights to and from other Caribbean destinations. While it does not take in large aircrafts, it still plays an important role of being a valuable air cargo hub. Those that love travelling by boat, ferries are a perfect way to enjoy St. Lucia's lush breathtaking surroundings. This type of transportation will allow you to visit the beautiful island of Martinique, and from there on you are welcome to see the nearby Dominica and Guadeloupe. No matter where your destination takes you, St. Lucian ferries open up endless possibilities in discovering the exquisite natural beauty of the island and its neighbours. St. Lucia provides the best accommodation options where each guest gets that well-deserved luxury treatment. Most of the resorts on this gorgeous island are situated on flawless, unspoiled beaches, tucked away into forested hillsides or secluded coves. A true paradise, when you want to really get away from the every day life into a quiet tropical oasis. St. Lucia has a great selection of villas, boutique and luxury hotels, couples-only and adults-only resorts, family-friendly and all-inclusive impeccable spots will please anyone's taste and budget. Those that are looking for a more private yet affordable accommodation, apartments, guest houses, and condos are there at a great selection and reasonable price ranges. There are only a number of all-inclusive properties in St. Lucia, but those that are available provide the best service, sophisticated ambiance and the simplicity of budgeting for your perfect St. Lucia vacation, as all the meals, entertainment, transportation and amenities are already included in the package price. What's great about all-inclusive lodging in St. Lucia is that these resorts not only include standard activities like tennis, guided tours or horse-back riding, but also throw in perks that will keep you busy throughout your vacation. Golf lovers can spend their day at a golf course, while water sports enthusiasts can take a sailing lesson or a deep-sea fishing excursion. There is plenty to do for everyone, and no matter what type of accommodation you select, St. Lucia will never let you leave without having your best vacation on this mesmerizing island. 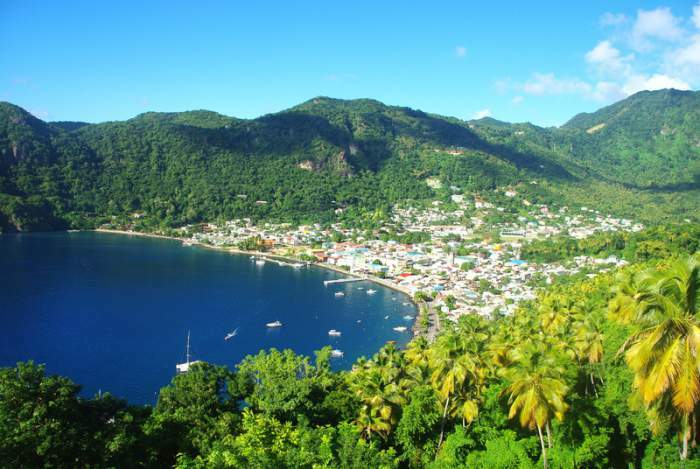 St. Lucia enjoys a tropical climate and its weather during the slow season can get quite hot. Although the period from December through February is part of the high season for St. Lucia vacation, they are the coolest months of the year with the temperatures ranging between 25-27 degrees Celsius (77-80 degrees Fahrenheit). The weather in St. Lucia starts to get warmer in March with the average temperatures of 26 degrees Celsius (78 degrees Fahrenheit). The weather during April and May becomes warmer and more enjoyable compared to the winter months, with the temperatures around 28 degrees Celsius (82 degrees Fahrenheit). June through August are the hottest months in St. Lucia. Temperatures during this time range from 25-31 degrees Celsius (77-88 degrees Fahrenheit) with a light, pleasant tropical breeze, while September and October are considered to be the most humid months of all but with the same temperatures as in the summer months. If you are a fan of hot weather and a lot of sunshine, less the humidity levels and rainfall, visit the island in November. Gorgeous lush scenery, picturesque beaches and warm sunrays will make you want to stretch out your St. Lucia vacation longer. Public Transportation in St. Lucia is very reliable and inexpensive way to get around the island if you are not planning on renting a car. Privately owned minivans that have green number plates with a letter "M" run on a regular basis and are the primary use of transportation among the locals as well as tourists on St. Lucia vacation. Although the bus stops are marked and are hard to miss, passengers are also able get a ride from the areas that are not considered as the official bus stop. Just wave to the passing minivan, it will stop to take you onboard. Let the driver or the conductor know where you are going and they will let you off at your desired spot. Even though buses do not run on a specific schedule, there is never a long wait, and you can expect a bus as late as 10:00 p.m. during the weekdays and a little later on Fridays and Saturday. Sunday service is slower, so if you need to get somewhere, hire a taxi. There are two types of taxis available in St. Lucia. Water taxis are ready to provide their service in all ports, fisheries and on the beach, while land taxis are available at the designated taxi stands or can be called over the telephone. Taxis in St. Lucia are licensed and have license plates beginning with "TX". Taxis are not metered, but fares are reasonable and pretty standard. It is advised to agree on the price with the taxi driver before getting into the vehicle and confirm what currency the price is quoted in. This will avoid misunderstanding and confusion down the road. Minimum age to rent a car in St' Lucia is 25. Driving in St. Lucia is on the left-hand side, British style, and those who plan to explore the island by car during their St. Lucia vacation will need to acquire a temporary permit, that can be obtained either at the airport or the car rental agency itself. The temporary permit, a valid driver's license from your home country and the age requirement are the most important prerequisites for renting a car in St. Lucia. Roads in St. Lucia are narrow, partially mountainous, unlit in a lot of places, with potholes, bumps and blind corners, so be extra cautious when driving. Speed limit in the city area is 48 kph (30 mph) and 80 kph (50 mph) on major highways. You will find that pedestrians often walk at the curb of the road, so watch out for people as well as the crossing animals when driving. If you get flagged down by a local, roll up your windows and continue driving, do not stop. When planning on touring St. Lucia, many tourists doubt what type of vehicle to get. If your goal is to visit more secluded and out of the way spots, situated further from the main roads, then a 4WD jeep will help you get the most out of your St. Lucia vacation. Other than that, a regular passenger car will be more than sufficient to discover the beauties that St. Lucia has to offer. The Eastern Caribbean dollar (EC$) is St. Lucia's official currency and is widely used across the island. The same currency is used in Antigua and Barbuda, Dominica, Grenada, Saint Kitts and Nevis, Saint Vincent and the Grenadines, Anguilla and Montserrat. Tourists may also use US dollars as well as major credits cards at restaurants, cafes, shops, taxis, car-rental agencies, and larger resorts and hotels. ATM machines are easily found at bank branches and some shopping centers ,but be prepared, they only dispense Eastern Caribbean dollars. Although tourists are able to freely use US dollars while on St. Lucia vacation, it is still more convenient to exchange them for local currency, as all the change is given in EC$ which makes it easier to pay for purchases, provide tips and avoid currency conversions that vary by the vendor. To avoid paying more during the price conversion process, it is more convenient to pay with the same currency that the price is quoted in. The difference in prices will not be too significant if done once, but it can add into a considerable amount during your entire St. Lucia vacation. Most St. Lucian hotels and restaurants include a 10% service charge in their initial invoice, but if you are pleased with the service, supplement the waiter or the hotel employee with an extra 5%, they will thank you. Taxi drivers expect a 10% tip, while bellhops and porters receive $1 per every piece of luggage the assistance is being provided for. Maid and room service staff normally receive $2 per day, but if you want to show your appreciation and tip more, you are always welcome to do so. All-inclusive resorts normally include the tips in their St. Lucia vacation packages, but if you decide to tip a few extra dollars to acknowledging the excellent service you received, you may gladly do so, it will not have any impact on the service, but your generosity will be valued. Tipping might be prohibited at some all-inclusive resorts in St. Lucia, and if the employee accepts any form or amount of gratuity from a guest, it can result in them being fired off the job. To avoid misunderstanding, inquire about the policies of the resort you are planning on visiting prior to your arrival on the island. There are street and beach vendors in St. Lucia and for those that are not interested in shopping in their tents, it can become intimidating at times. If you are not purchasing anything in their huts, be polite with a firm "no thank you" and walk away. Rest assured, St. Lucians are very welcoming and heart-warming people, they will never harass or make you buy their products during your St. Lucia vacation. These folks are there to make money and some of them try to make their ends meet by selling their handcrafted items. In order to survive and feed their families, sometimes they become a bit pushy to make a profit. A lot of the St. Lucian vendors have complained in the decrease of sales in the last couple of years, making it harder for them to sell their merchandise at specific prices. And although bargaining is popular on the island, the vendors kindly ask that tourists do not push the prices too low as tourism is vital to St. Lucia's economy. St. Lucia is a relatively safe Caribbean island, but it is still wise to take security measures into account when going on St. Lucia vacation. If you are leaving your hotel, it's best to leave your valuables in the rooms' safe or security box. Do not tag anything of value with you, as it might draw unnecessary attention and can cause problems of petty theft down the road. If you need to leave the resort in the evening, take someone to accompany you, and always walk in the middle of the road whether it's dark or not. If you are driving and find yourself flagged down by the pedestrians, do not stop or open up your car windows, just continue driving. 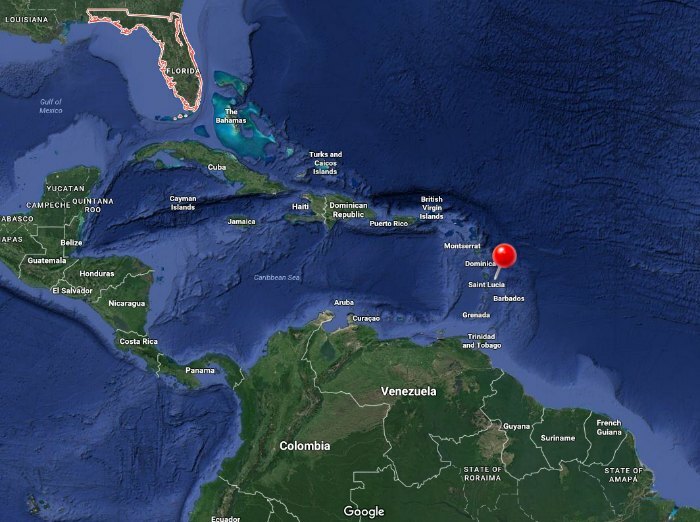 Recently, Chikungunya Fever that has spread out to the Americas, St. Martin and some other Caribbean islands including St. Lucia. It is an important thing to consider when travelling to St. Lucia. Although this is not a dangerous virus, a traveller should take all the necessary precautions in order to avoid nausea, fever, headache, fatigue, joint and muscle pain that are the most common symptoms of this bug. The virus breaks out from a mosquito bite, and chances of getting one are higher during the island's rainy season. To keep yourself safe and to prevent this fever, always pack a bug repellant. One of the most important laws in St. Lucia is that wearing Camouflage clothing and luggage is against the law and there are serious consequences if you are spotted wearing the Camouflage print. The punishment can even result in jail time, at other times your Camouflage items will be confiscated, even undergarments. If you are not looking for a hefty fine or jail time, play it safe, leave all of your Camouflage gear at home, including children's items, when you go on St. Lucia vacation. Water in St. Lucia is safe to drink, so tourists should not have any problems while vacationing here. Tap water on the island is chlorinated and safe; however, for those that have sensitive stomachs bottled water is readily available and is very affordable everywhere you go, so you can have a peace of mind on your St. Lucia vacation. If you are planning on leaving the resort or if you are staying longer outside in the sun, you can fill up a bottle of water in your hotel suite and bring it with you to stay hydrated. But not to worry if you find yourself thirsty, while on a trip outside of the resort area, local shops and restaurants sell bottled water and ice and they are easy to locate. Some of the newer resorts and hotels in St. Lucia have 110 voltage plugs, but this is not common. Electricity in St. Lucia is from 220-240 volts with the utility frequency of 50 cycles. Most plugs on the island have openings for 3 rectangular prongs, so visitors from the United Kingdom and other parts of Europe will have no problem using their own appliances in St. Lucia. Guests from North America will need transformers, plug adapters and/or converters in order to use their devices safely and to avoid them being burned out during their St. Lucia vacation. Some hotels provide the converters, but double check with the place you are staying at to make sure a converter is guaranteed to be available when you arrive.